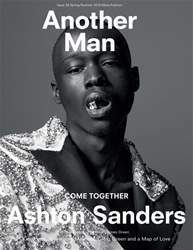 (0 Customer Reviews) | Write Review 2 issues per year Another Man is a thought-provoking bi annual magazine with a blend of high fashion, art and culture. It combines intelligence, luxury and a sense of adventure. This season, Another Man orbits planet Earth for a global gathering of creativity and positivity. With shoots from Japan and China to India and the Moon, and art projects exploring imaginary, hidden realms, Spring/Summer 2019 is a soulful celebration of the world we live in, real and unreal… ASHTON SANDERS fronts two powerful covers, photographed by Ethan James Green and styled by Alister Mackie. Inside, the 23-year-old actor charts his evolution from LA child misfit to leading man on a mission. Another Man is a thought-provoking bi annual magazine with a blend of high fashion, art and culture. It combines intelligence, luxury and a sense of adventure. You'll receive 2 issues during a 1 year Another Man Magazine magazine subscription. You'll receive 2 issues during a 1 year Another Man Magazine magazine print subscription.